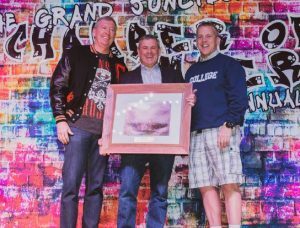 A tradition for over 28 years, the Grand Junction Chamber of Commerce’s Annual Banquet kicked off 2019 with a bang on January 25th. Guests arrived dressed in their 80’s best, ready to celebrate the successes of 2018 with their fellow local business community. 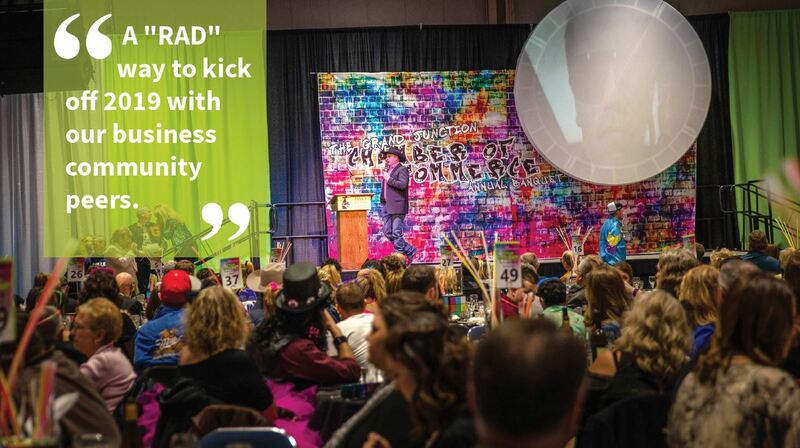 The over 700 guests were treated to a night full of nostalgia including their favorite 80’s movie clips, a “totally awesome” 80’s dance party, and an arcade featuring favorites such as Pac Man and Space Invaders. A highlight of the night is our celebration of the Business of the Year, Citizen of the Year, and Young Professional of the Year. Selected by previous honorees, these winners joined an elite group of local business leaders that we are lucky to have in our community! Whitewater Building Materials has been a fixture in the community in some fashion since 1948 when company founders moved here to build the eastbound bridge on Highway 340 to the Redlands, a structure that still s tands and is utilized by thousands of cars a day. Four generations of the Gardner family have been part of the management team of this family owned, family led enterprise. It is safe to say most of the non-profits and their clients in this community have been supported by Whitewater Building Materials in some way including St. Mary’s Hospital, HopeWest, Hilltop Community Resources, Salvation Army, Marillac, Habitat for Humanity, 4-H, Girl Scouts, Boy Scouts, Partners, Roice-Hurst, Grand Valley Catholic Outreach, and Community Food Bank to name just a few. Their philosophy of being community supporters extends to even showcasing the mascots of area high schools on their trucks! Quint Shear, of Shear, Inc. was honored as the Citizen of the Year. A fulltime resident of the community since he was 13, Shear is a graduate of Colorado Mesa University and gives generously of his time. Currently he serves on the Grand Junction Economic Partnership Board of Directors, Colorado Mesa University Foundation Board, Mesa County Federal Mineral Lease District, West Slope COGA (where he served as President from 2016 to 2018), Colorado Oil and Gas Association Board, Western Slope Snowmobile Association (where he served as President for four years). 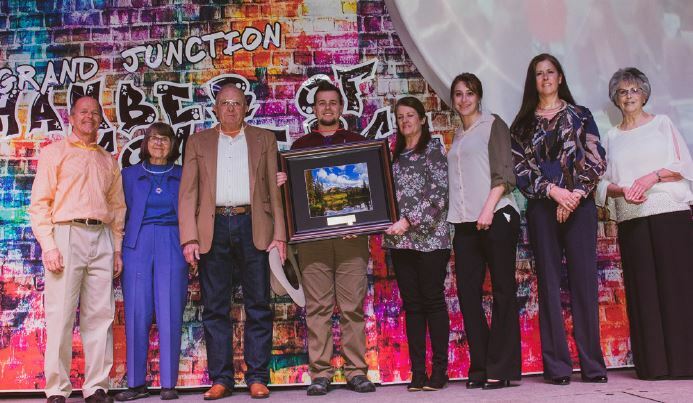 That is in addition to his volunteer activities as a member of the Mesa County Search and Rescue Snowmobile Team and as a Senior Partner/Mentor with the Mesa County Partners Program. He and his junior partner Josh have been together since 2014. Anna Stout was recognized as Young Professional of the Year. 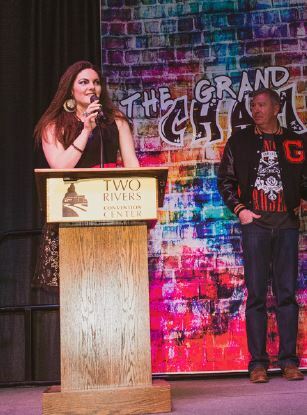 Born and raised in Grand Junction, and a graduate of Grand Junction High School, Anna founded an organization at the age of 19 called the Foundation for Cultural Exchange. This local nonprofit promotes meaningful partnerships with the people of El Espino, El Salvador, working toward lasting economic and social development. After graduating from Mesa State College in 2009 and receiving her Master’s in Global Affairs from the University of Denver, Anna was named the Executive Director of Roice-Hurst Humane Society in 2015. Since then, she has grown that organization’s endowment from 50,000 to almost 800,000. Anna has served on several boards including the Latino Chamber of Commerce, KAFM Community Radio Advisory Board, The World Affairs Council, CASA of Mesa County, GJ Rockies host families, Riverside Education Center, and many others.